Preheat oven to 350° F. Prepare 9x13 cake pan with non-stick cooking spray. Prepare cake mix as directed on package, using the eggs, oil and water. (NOTE: These ingredient measurements are specific to a Betty Crocker™ Super Moist™ Cake mix.) Pour batter into pan. Wash, peel and slice the peaches. Lay slices on top of batter. 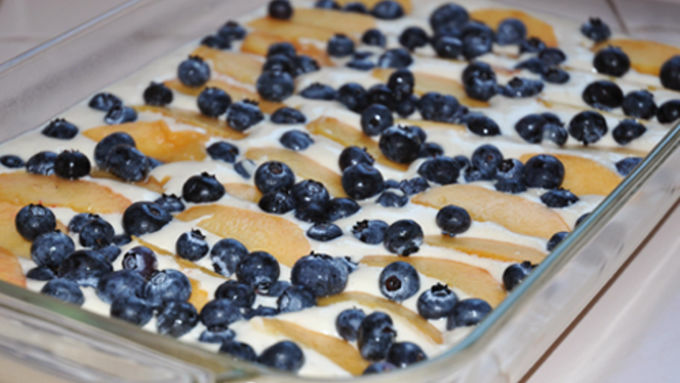 Wash blueberries and sprinkle over peaches. 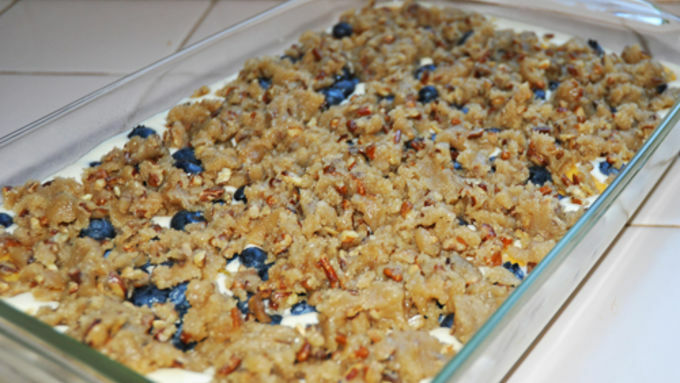 In a medium bowl, combine melted butter, brown sugar, flour, nuts, and spices. Mix well to make streusel and sprinkle over fruit. Bake cake at 350° F for 35-40 minutes, until golden and a toothpick comes out clean. Fruit will drop to the bottom during baking. 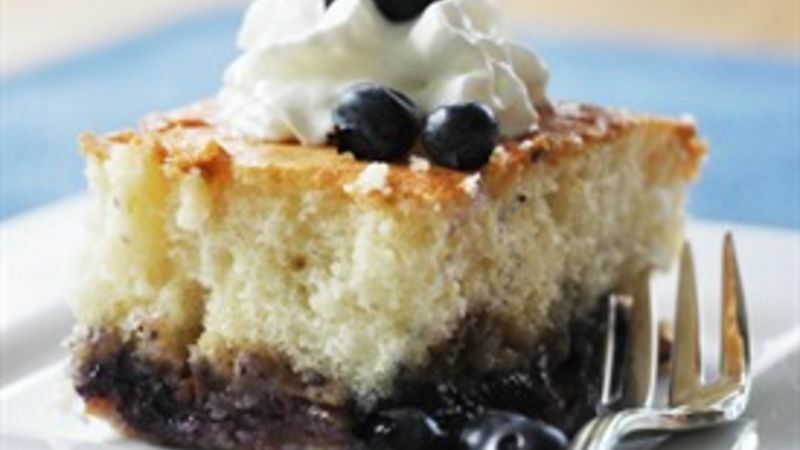 This cake is delicious served warm with softened vanilla-bean ice cream or whipped cream sprinkled with fresh blueberries. It is also good cooled or chilled. Refrigerate any leftovers so the fruit on the bottom doesn't spoil. Retro Recipe Redo is a new Quick Dish series that gives old recipe faves a mini makeover so they're easier and quicker for today's busy cooks. This week's recipe redo: Fruit-Bottom Cake! 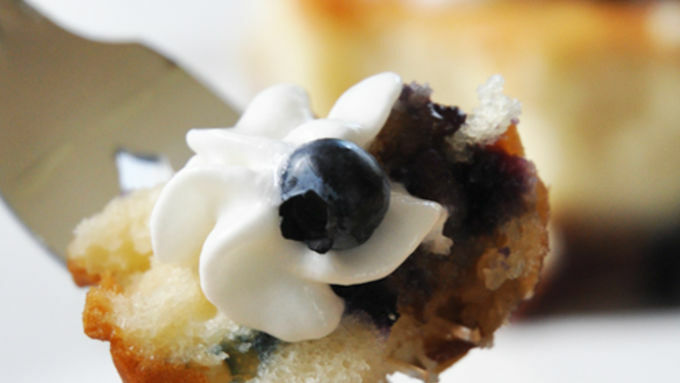 Light and fluffy on top, moist and fruity on the bottom -- vintage taste brought up-to-date with a cake mix kick start. My fresh peaches and blueberries were planning to elope. Admittedly, they're the perfect pair, but I wasn't ready to give them my blessing just yet. I had to think fast, so I married their summery tastes in this super easy cake with a fruity base: This recipe is crazy and fun. And easy? Oh, yah, it's easy.